1) Click on the ‘Counter‘ button on the Operational Panel of the machine. 4) The second figure we need is the Color Total, and the figure we need is found under Total column. 1. Press the Menu button at the top of the circle on the user interface. 4. 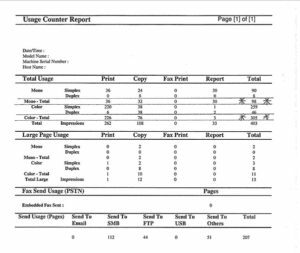 It will give you the option to Print, select yes and it will print out a usage report. 5. The figures we need are ‘Mono – Total‘ and ‘Colour – Total’, and the figures needed are under the total column.